The Resource Center provides a great space for student organizations to gather and sing their hearts out! The SORC Karaoke Room (HUB 111-C) is the best way to hang out and have fun with friends or get your club members together for some vocal bonding. The Karaoke Room has it all – the karaoke system with 2 wireless mics, a light globe, comfortable seating. And the system has all sorts of artists and genres available – rock, pop, country, boy bands, girl bands, oldies, rap, classic rock, r&b, rockabilly, etc. What are you waiting for? 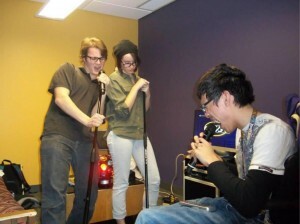 Students can reserve the Karaoke Room online. There is a 2-hour limit for the funnest room at the Resource Center. This is just a short list of artists that are available in the SORC Karaoke system.